Whoa! Push! There! She's in the hole! The tree being planted below isn't just any tree. It's an American elm, Ulmus Americana ‘Valley Forge,’ a type we are helping to get planted along the sidewalks of Embassy Row. The men aren't planting it any old place but just inside the sidewalk beside the famous Blaine Mansion (2000 Mass). The new tree fills a gap in the line of "second row" trees on south side of the 2000 block of Mass Ave. The sidewalk and driveways have been a terrible 'heat island;' as the tree grows it will provide cool shade for thousands who pass there. 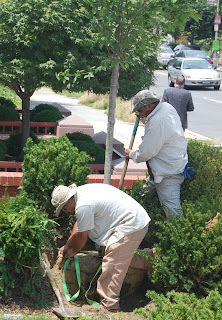 Left: Landscape Development Inc. plants by the Blaine mansion June 13. 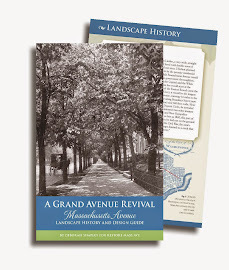 We're grateful to Phillips & Cohen, the owner/restorer/occupant of the 1881 Blaine house, to Gay Crowther of Crowther Landscape Architects of Annapolis, Md., and to Jim Burch of Landscape Projects (Woodbine, Md.) for choosing the type we need and siting it a perfect historic position. Watch this tree grow! You can also look for the two 'Valley Forge' elms starting to grow nicely by the Embassy of Indonesia (2020 Mass). In March, 2011, the Embassy hosted a Community Planting with us and our partner Casey Trees where four trees were added there, including two "second row" elms (See www.restoremassave.org/events.shmtl). 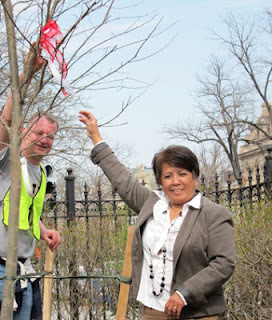 Above: Nino, of the Indonesia Embassy, is a wonderful maintainer of all the plants there, by a new 'Valley Forge' elm at the corner of Mass Ave and 21 Street. Left is Robert Tarasovich of RMA. Please look for these trees to see how well they're growing, thanks to the Embassy's care. The brand new one by the Blaine Mansion will be well cared for, we're sure. Thank you! Phillips & Cohen and Indonesia Embassy, for 'restoring' Mass Ave's historic landscape. Trees provide many ecological benefits, and also beautify the landscape. Tree Care.